1. ​Tell us a little bit about yourselves, your background and your areas of expertise. What attracted you to this sector? We have collaborated since 2007 to help promote positive touch activities in the home, school and wider community. We then combined our joint experience to develop the Story Massage project and share respectful touch with all ages and abilities. Mary: I am an award-winning complementary therapist and author of four books on massage, including Healing Touch for Children (Gaia, 2009). I regularly talk at conferences and I write articles for national magazines on the power of positive touch for children in the family home. I have worked in palliative care since 2000. ​2. Can you explain what story massage for children is? It is something anyone can do? Is it appropriate for a specific age group? ​Story Massage involves the use of ten simple massage movements (through clothes), which are associated with spoken words to build up an engaging story. Tracing a large circle on a child’s back, for example, can depict the sun, while raking with the fingers can represent lions’ claws. The concept of story massage is certainly not new. Indeed, it is as natural and intuitive as both sharing touch and telling stories. Most of us can remember writing our names, adding numbers or drawing pictures on friends’ backs as a creative guessing game. These action games, songs and rhymes are a form of story massage. They have long been enjoyed as a fun and nurturing activity, but we are extending this so they become a way of communicating, engaging interest and encouraging skills such as fine motor coordination and emotional literacy. Our story massage strokes can be shared wherever is accessible and acceptable for a child – back, hands, feet, arms, legs... No oil is used and children do not need to remove any clothes. Storylines and massage moves can be adapted to suit the individual needs of children of varying ages, personalities and temperaments – so it is fully inclusive. It has been used with people ranging from babies to the elderly in care homes, and everyone in between! 3. What’s the best way to learn how to do story massage? Is formal training required? We would suggest that you start by reading our book Once Upon a Touch… Story Massage for Children (Singing Dragon Books, £11.99) which is available from our website or from Amazon, bookshops and public libraries. This includes instructions and illustrations for the ten main strokes, plus a selection of over 25 massage stories for you to try at home. ​Meditative stories. Calming stories can help to relax the mind and body, easing tension and the cumulative effects of stress. Children can learn the essential skill of conscious relaxation through first-hand experience of recharging and refreshing mind and body to be better able to cope with the constant demands and expectations of everyday life. Story massage as therapy. Story massage can help build trust through a shared connection. Over time, it can encourage the discussion of concerns and anxieties in a calm, safe environment. It offers an opportunity to engage in experiences that provide a context for the use of emotional language so a child has the words to verbally express feelings. Stories can be chosen on topics such as "first day at school" or "a new baby in the family". Story Massage is now part of the sensory curriculum in many special schools. We have heard from sensory coordinators who find that the combination of positive, nurturing touch with the familiar words of stories helps encourage communication and meaningful engagement even among those with the most profound disabilities. It can also be used an intensive interaction with colored lights and music to accompany the activity. It is such a simple concept that it can easily be shared with parents of children with special needs and enjoyed as a fun, touch-based activity in the family home. Another boy with verbal dyspraxia and has gradually started to read the story at the same time as the massage takes place. This has boosted his confidence and self-esteem. For several children, the combination of words and touch has helped them to remember a sequence of events, actions or words. Story Massage has been used as a social story to help children prepare for a something such as going to the dentist, or for transition from one activity to another, or one class to another. 6. What are the main strokes? There are ten simple massage strokes that form the basis of story massage. These strokes each have a child friendly name, such as The Wave or The Bounce, and an easy-to-recognize symbol making it accessible for all ages and abilities. An example of one of the strokes is The Circle. To do this you rest one hand on your child’s shoulder. With the flat of the other hand, make a large, circular movement on the back. This can be in a clockwise or anti-clockwise direction. It can be applied on different parts of the body with varying pressures and speeds depending on the accompanying words. Within a story this may represent many diverse objects, actions or emotions – ranging from a cake or a face, to dancing or a feeling or completion. 7. What tips or advice can you give to people who want to try story massage with their children, grandchildren, or students? The most important thing is to remember that this is a fun activity that is respectful and child-centered. Never force a child to take part if they don’t want to. Children should be asked if they would like to have a story massage, and then afterwards the person giving the story massage should thank the person receiving the massage. Listen to feedback from your child and adapt it using favorite strokes and stories to make the child feel extra special. The intention of story massage is sharing safe, healthy and positive interaction with others. It is great fun to adapt or invent stories to make them relevant to your own family. It is creative, interactive and personalized, making it a wonderful activity to make your own as part of quality family time together. ​8. What’s the most interesting or surprising thing you’ve seen or learned related to story massage, or what’s one thing people would be surprised to learn about story massage? We have been surprised by the way that it has been used in so many different settings with people of all ages and abilities. It is so simple that it can be used anywhere and everywhere – no preparation is needed and no special equipment is required. We have heard from people using story massage in refugee camps in Turkey and Calais, nursery schools in Kenya, community projects in Nepal, townships in South Africa and with street children in Vietnam. It is so amazing to be part of a project that is making such a real difference to the lives of people all over the world. 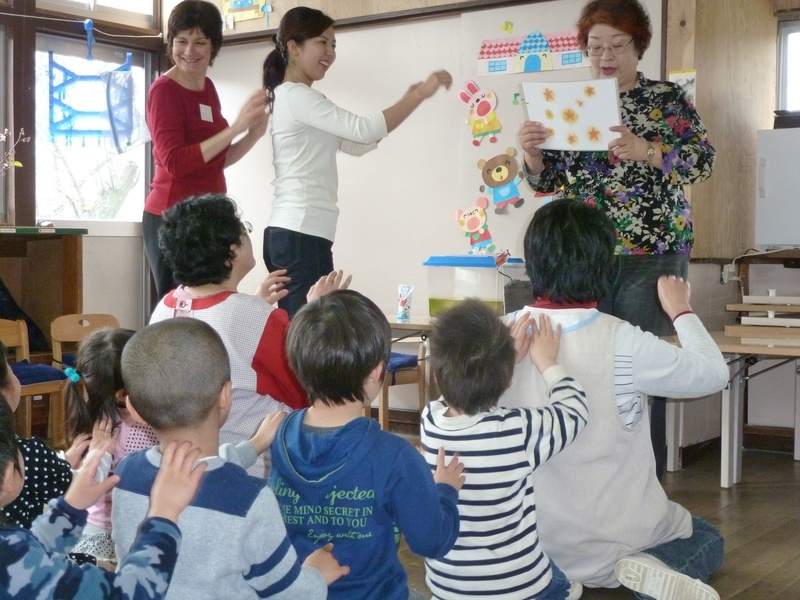 In April 2012, Mary was invited to travel to Japan by Cocoro Charity to introduce story massage for children suffering in the aftermath of the tsunami. With the help of social workers and bereavement specialists, a massage story called The Smiling Flowers was written especially for the children. The story was based on the healing power of nature and designed to help with the emotional trauma they were all experiencing. Mary took the story to kindergartens and nursery schools and found it a really humbling experience. They children and teachers loved it, and the children smiled, many for the first time since the disaster, and immediately wanted to take it home to share it with family and friends. The local social welfare team felt that it had been an emotionally healing experience for everyone on so many levels. The children have now written many more stories and continue to share them in schools and in the family home as part of the healing process. This was the start of the Story Massage project. To celebrate this blog, we're happy to send you a free copy of The Smiling Flowers Story Massage, which has now been translated into many different languages. Simply email us at info@storymassage.co.uk. We love to stay in touch with people and share the benefits of story massage. There’s lots of information on our website: www.storymassage.co.uk, where we have a regular blog about the ways that story massage is being used and new massage stories. We also have an active Facebook page and Twitter feed. We have uploaded many different massage stories in action on our YouTube channel. Previous Post Can You Increase the Fat in Breast Milk? Next Post How Much Sleep Does a 6-Month-Old Need?